JPMorgan Chase reported record profits for the third quarter, with increased revenue in every business line. New mortgages and refinancings were a key driver of overall results, but performance was also strong in commercial lending, investment banking, credit cards and auto loans. "Importantly, we believe the housing market has turned the corner," CEO Jamie Dimon said in a written statement. The bank recorded a $6.2 billion loss from the so-called London Whale -- the massive bet made earlier this year in Europe that produced billions in losses. On conference calls, JPMorgan executives would note only a "modest loss" for the quarter from the trade. Dimon said that the bank is still unwinding the trade and called it a "sideshow" during an otherwise stellar quarter. Overall, Dimon and other JPMorgan executives painted a picture of an improving economy with core loan growth increasing 10%, and mortgage volumes up 29%. Dimon said he expects origination of new mortgages to stay high over the next several quarters. Impact of QE3: The Federal Reserve's latest round of stimulus -- so-called QE3 -- boosted mortgages this quarter, but Dimon said the Fed's low rate policy hurt other parts of the business. "The bottom line isn't related much to QE3 at all," said Dimon, noting that lower interest rates hit the banks profits in other ways. While he's optimistic that QE3 could help the economy overall, he said ultimately fiscal policy -- addressing taxes and government spending -- will be more important. Job cuts: The bank cut 3,000 jobs this quarter, but headcount overall is up 1% in the past year to 47,412. Those cuts were largely related to cutting employees who helped service mortgage defaults. Dimon said headcount could come down slightly but largely from that segment of the bank. European exposure: JPMorgan now has more exposure to Europe than last quarter, but Dimon said that came largely from the unwinding of short positions. The bank plans to continue doing business in Italy and Spain, Dimon said. If the price was right, Dimon said JPMorgan would even consider buying banking assets there, but they don't have any immediate plans to do so. The numbers: Revenues increased to $25.9 billion in the third quarter, up 6% from last year's third quarter, and beating analysts' estimates of $24.5 billion. The company also beat expectations for profits: it reported $1.40 per share, above forecasts of $1.22. The stock traded down slightly, despite the robust earnings picture. JPMorgan's shares (JPM) have soared 26% this year, and investor expectations were high for this quarter. While the stock tumbled nearly 30% after the bank disclosed its massive trading loss on May 10, it has more than made up that ground. Overall, bank stocks have outperformed the S&P 500, which is up 14% this year. This comes after most bank stocks generated double digit losses in 2011. Legal risks: JPMorgan declined to provide further information on any ongoing litigation related to LIBOR, the London Whale loss or the mortgage lending practices of Bear Stearns, which JPMorgan purchased during the financial crisis. The bank did tuck away an additional $684 million in reserves for future litigation expenses. Dimon said he was surprised to see New York's attorney general file suit against JPMorgan for Bearn Stearns' mortgage banking practices, because the Bear Stearns deal was orchestrated with the U.S. government. Dimon said that the government "bankrupted" General Motors and then absolved it of its legal liabilities. The failure to do the same thing for JPMorgan is "inconsistent," he said. 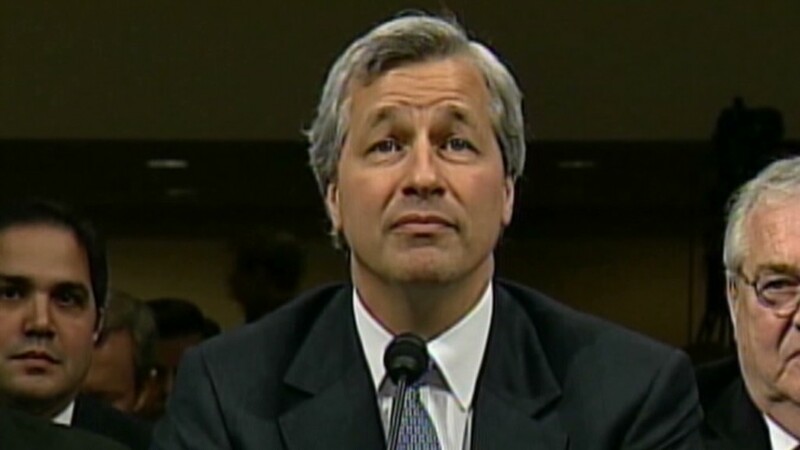 Management changes: Dimon also declined to comment on reports that CFO Doug Braunstein would be moved to another position at the bank or on any other changes to senior management. Dimon said the bank has a "deep bench."